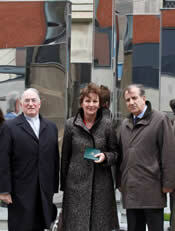 The St Andrew's Cathedral Italian Cloister Garden was officially opened on Monday, 16 May 2011. This followed 18 months of work to create the dramatic new space next to the Cathedral. The garden has as its focal point a monument commemorating the Arandora Star tragedy, designed by Roman architect Giulia Chiarini. 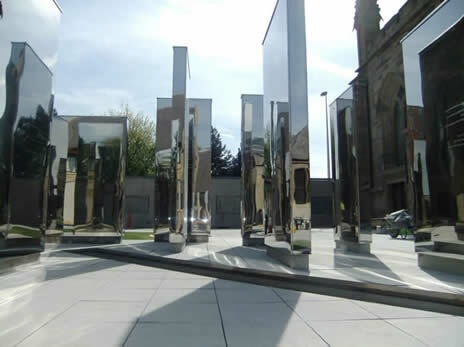 Its monumental mirrored plinths with inscriptions from the Gospel and the Italian poets, are set in a grass and slate landscape. A 200 year old olive tree, gifted by the people of Tuscany as a sign of peace and reconciliation is planted at its centre and a fountain and stream traverse the central space, symbols of life and hope. Around the walls, marble plaques tell the story of the Cathedral, of the Catholic revival in Scotland and of the Arandora Star tragedy. 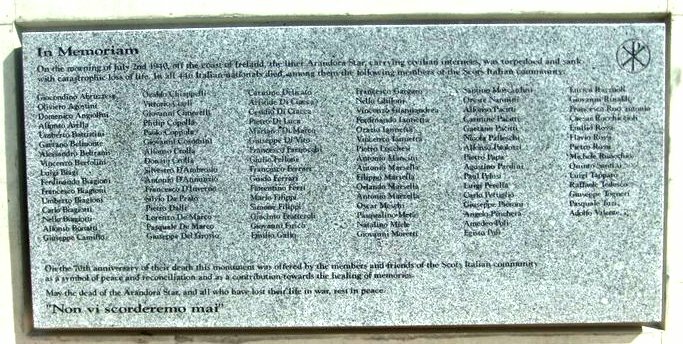 The names of every one of the Scots-Italians who drowned on the ship have been carved on the central plinth. The splendid new facility is open from dawn to dusk and has already become a favourite tourist spot for visitors in Glasgow. It will also serve as a versatile and much-needed pastoral resource for the thousands of people who frequent St Andrew's Cathedral each week. At the opening, Archbishop Mario Conti was joined by First Minister Alex Salmond, the Lady Provost of Glasgow and Mr Rando Bertoia, the 91 year old who is the only living survivor of the Arandora Star tragedy which is commemorated in the central monument. Also present were Giulia Chiarini, the architect from Rome who designed the garden and monument and representatives of the civic authorities in the towns from which most Scots Italians come – Barga and Pistoia in Tuscany and Picinisco and Filignano in the Lazio region south of Rome. Musicians from Milan were flown in to provide musical accompaniment to the events. The iconic silver mirrored central monument in the garden will recall all who died aboard the liner the Arandora Star, which was sunk while carrying mainly Italian civilians who had been rounded up from their homes, shops and cafes as “enemy aliens” in 1940. It is the largest monument to the disaster anywhere in the world. The inscriptions on the central monument have been carefully chosen from the Gospels and the great Italian poets to reflect on the great mysteries of love and loss, life and death, especially in the light of the Arandora Star tragedy. 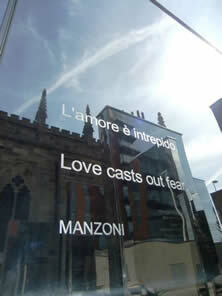 Translations courtesy of Professer Eileen Anne Millar, Emeritus Professor of Italian, University of Glasgow. The building and opening of the Italian Cloister Garden brought much media interest. Click on the links below to read and see some of the coverage. The garden has already attracted some high profile visitors. Violinist Nicola Benedetti visited as part of the launch of her new musical collection "Italia". 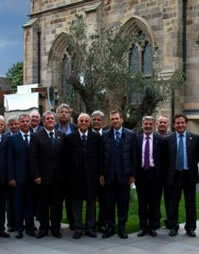 The President of the Lazio Region and a group of Mayors from the area around Cassino visited the Garden in late 2011. The Archbishop thanked them for their generous contribution to the project.